This issue of Cardiac Electrophysiology Clinics, edited by Drs. Noel G. Boyle and Bruce Wilkoff, will focus on Lead Management for Electrophysiologists. 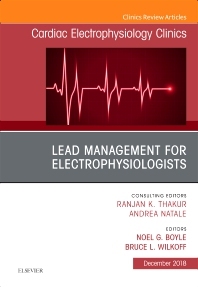 Topics include, but are not limited to, Overview of Lead Management; Vein Management; Electrode Management; Infection Management; Definitions and Metrics; Tensile Properties; TOOLS for Lead Extraction; Complications : Vascular, Cardiac, Thrombotic & Hemorrhage; Rescue; Outcomes & Registries; Reimplantation after Lead Removal; Venoplasty and Stenting; Palliation & Non Extraction Approaches; Surgical and Hybrid Extraction; Anesthesia Considerations for Lead Extraction; and Role of Imaging in Lead Extraction.